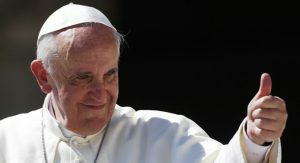 Pope Francis Schedule now includes a visit Colombia in 2017!! !…at last a Pope is coming! In 2016 Pope Francis promised to schedule a visit to Colombia, if and when, a peace deal was agreed. President Santos duly delivered. The FARC signed on the dotted line in Cuba. The Colombian government ratified the peace accord at the end of 2016. President Santos bagged himself a lovely golden Alf Nobels medal. And the Pope added a vacation to Colombia on his 2017 wall planner. Everyone’s happy. Except, why did he have to wait until the peace accord was 100% ratified to visit Colombia? What was his reasoning? Does he not like Ajiaco? Has he been watching too much Narcos on Netflix? It’s not like he is unfamiliar with Latin America. After all, he is Argentinian. Since he was elected to the papacy in 2013 he has visited six different Latin American countries. Brazil, Bolivia, Ecuador, Paraguay, Cuba (Twice), Mexico. He could have just popped in to say hello! Had a quick coffee and a chat with President Santos. Maybe he doesn’t know, but we always have coffee. He is not the only one though. We have not had the pleasure of a Pope since 1986. When Pope John Paul II (my favourite Pope), got lost on his way to the Mexico ’86 World Cup. That was three Popes and thirty years ago. Outrageous! Let’s ask ourselves the reasons why he might not have come to Colombia… Without getting too self-conscious. Firstly, we have suffered a long civil war here in Colombia. Is he concerned for his safety? 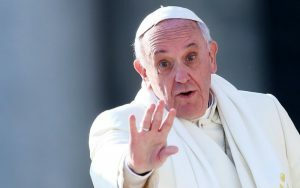 In a radio interview in 2016, the Colombian ambassador to the Vatican, stated that the pope had agreed to come to Colombia. If peace was agreed. This indicates that his visit was dependent on peace. Lets be honest, the conflict was a bit of a slow burner. The insecurity of the 1980’s and 90’s was a combination of factors, not just the war against the communists, which had been ongoing since the mid-1960’s. 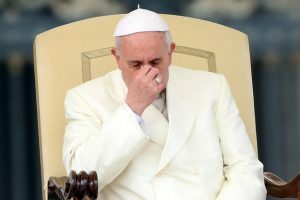 Who would harm the Pope in Colombia anyway? The FARC leader Timoleon ‘Timochenko’ Jimenez called on the pope in early 2015 to help negotiate peace. I don’t know for sure, but I assume a lot of the guerrillas and paramilitaries are also Catholic. He would have been as safe as houses. 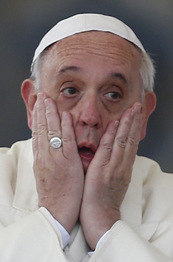 Pope Francis is 80 years old. Could age be a factor? Well if you haven’t already worked it out, he is coming next year when he will be older. Before he was younger. Its basic maths. And yes I’m clutching at straws here. Besides, my 80 years old parents visited Colombia in 2015. The furthest they had been before that, was on an all-inclusive to Torremolinos. We won’t accept his age as an excuse. What if he doesn’t like Colombia? Or for that matter Colombians? Well it would be a little strange if he didn’t like fellow Catholics. Colombia is a predominately Catholic country after all. 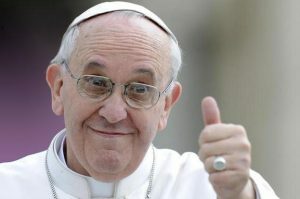 According to Wijngaards Institute for Catholic Research, the Popes is the “Supreme Pastor”. Quite a job title. This means that he represents “Christ’s love and concern for every single individual”. So unless the good folk at Wijngaards are pulling my leg. The Pope loves EVERYBODY. Including me. I love you too Pope. Lets give him the benefit of the doubt on this one. What if he was just too busy? He has visited a lot of countries during his tenure. He can’t visit them all. Well he did visit Cuba twice. He will also visit Brazil again before he visits Colombia. Seems a bit unfair no? Could it be he was just playing the old dangle the carrot move? Trying to solve the peace issue by promising some Pope time if it works out. The Pope is a veteran of the game. He would have played that hand earlier if it was his intention. Not when peace was all but sealed. In conclusion, I have no idea why the pope hasn’t visited Colombia yet. But it would have been nice for him to show his face some time ago. Colombia has had a lot of issues he could have helped to resolve. While I don’t doubt he has always called for peace in Colombia, and towards the end helped to guide it along. The people of Colombia, many of whom are staunch Catholics, deserved a papal visit. They needed a papal visit. The whole country needed a papal visit. A lift from the drudgery and hopelessness of the situation here for so long. But Colombians found peace the Colombian way. The hard way. They gritted their teeth, and fought through to the finish. The Pope will now come when all the heavy lifting has been done. To charge Colombia $40 million US dollars to appear, and we should be grateful. Well so be it. Let’s keep it positive. A papal visit will be a huge boost to the economy. People will be spending, spending and spending during his visit. It will seem like $40 million well spent. But isn’t it all supposed to be about the religion? To be honest I am not a Catholic. Nor am I even a Christian. I am agnostic at best. Atheist at worst. Scientist by choice. As a geoscientist I have held a rock in my hand that was 3 billion years old. Measured the isotopic decay myself. I have seen evolution at work, and found several living specimens of the ‘missing link’ in West Virginia. So the 10,000 year old earth theory doesn’t sit well with me. But I would never knock another human being for their religion. For their faith in life. For their faith in people. For needing some hope in desperate situations. For believing that the hard times will get better one day. I just think that Colombia needed a little bit of hope, a little sooner. The Pope could have made a real difference here. It was a missed opportunity. Viva Colombia! Previous Post: Palomino – Colombia’s Bohemian Paradise. Next Post: The Travellers Best Friend, The E-reader!